We’ve been photographing weddings in the Philadelphia area and beyond since 2013 which is fair to say- we have some favorite venues in the area that we absolutely get excited when an inquiry for these spots pings our inbox. Weddings at these venues are simply a breeze to photograph because not only are the teams that operate them are stellar and passionate about weddings, but the locations just make the most perfect wedding galleries! This list is ever growing as we photograph more and more in the area, but these have been our favorite from the 2018 wedding season! We have so many more amazing venues we’re excited to be shooting at in 2019 and can’t wait to share images from those venues with you all, but for now, these made our list from the most recent wedding season! Pomme makes the list for so many reasons! This venue is a beautiful blend between the organic outdoors and a modern wedding. 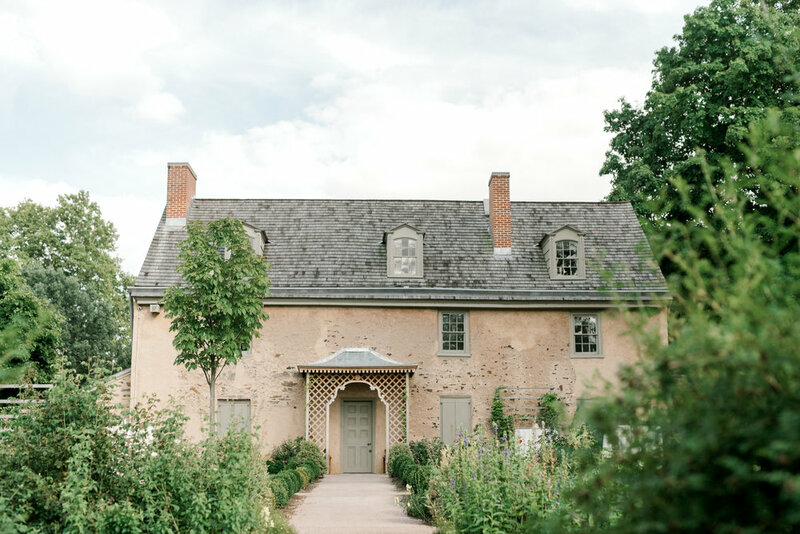 Nestled right on the main line, Pomme is tucked away under a canopy of trees, with a pond with swans, tall trees that provide shade during the warmer months, and an modern indoor reception space that photographs perfectly in any season, rain or shine! The light and airy indoor space is also a wonderful backup option incase of rain or gloomy weather. The space is fresh, modern, sleek and is basically a blank canvas that will fit with the theme of any wedding. But looks aren’t just everything- Peachtree Catering owns and operates this venue and are true culinary artists when it comes to their menu. If food is important to you, this venue is a must to check out! If you’re a hopeless romantic and a lover of the outdoors and history, this is THE dream venue for you. Another venue operated by Peachtree Catering (so again, if you’re a culinary lover- this venue is a must!) Also known as Hunting Hill Mansion, this stone castle-like historic venue is just west of Philadelphia in Newtown Square. It’s located in Ridley Creek State Park, so your wedding will truly be unplugged in a formal garden complete with stone walls, a reflecting pool and lined trees surrounded by lush and wild forest. The the entirety of the mansion was built in 1915, but was built around a historic farmhouse which was originally built in 1789! Say hello to the new modern rustic! Terrain is a garden lovers paradise bringing to you a garden shed vibe with natural wood and plants galore and just a touch of boho! In the warmer months enjoy the lush green environment both indoors and out with it’s overflowing supply of plants in the outdoor area and a greenhouse space that’s beautiful in sun and rain. And in the winter, enjoy the cuddly holiday vibes and patio lined with Christmas trees! Select from several different ceremony and reception locations to give your wedding the vibe that you want and make your day truly your own. What else? Pretty much everything is included with your Terrain wedding, it’s basically a one stop shop for the modern garden wedding of your dreams! FAME is Feast Your Eyes Catering’s newest venue that just opened up in 2018. When we saw this space, our jaws dropped! It’s the perfect venue for the modern couple that’s looking for an elevated city wedding with an industrial feel. The space is basically a giant white warehouse that’s lined with windows. As photographers, trust us when we say this is the perfect lighting situation for your wedding! The full wall of windows gives you a beautiful view of the Philadelphia skyline that’s gorgeous during the day and at night. Just picture saying your “I do” with the sun setting over the city behind you. Can you think of anything better? We can’t! As a bonus, don’t forget to ask if you can take some portraits on the rooftop, it’s a must have with this venue. In 2018, this was our most photographed venue and we can see why it’s so popular! Hotel du Village is a perfect mix between old and rustic and sleek and modern as it’s team preserves and improves the grounds and building. With so many options and locations for ceremony, cocktail hour, and reception, couples can tailor their wedding day depending on their vision. We’re also slightly obsessed with the checkerboard floors and the way the sunlight hits the lawn in the afternoon. I think the best way we can begin to describe the Maas Building is just downright cool. It’s outside space is an urban garden oasis with trailing vines and a green canopy of trees. It has a hip vibe that makes you feel like you’re in some posh Brooklyn patio. The interior space is a rustic warehouse space in wood and brick that can hold up to 100 guests. There is no other venue quite like the Swedish Museum in the area, in fact it’s the oldest Swedish Museum in the country. It’s unique exterior is inspired by a Swedish manor house, Stockholm’s city hall, and George Washington’s home and looks like something you’d find off the Mall in Washington DC. Rounded arcades on either side of the building with rows of open arches add a slight old world touch while still feeling modern and sleek. You also have access to the interior exhibition spaces which range from white rooms to red ones. The museum is also conveniently located in the middle of FDR park, with ample green space and scattered picturesque landmarks perfect for your portrait session. We love the outdoor tent that Jeffery A Miller Catering provides on the front patio- it’s partially clear, which allows for natural sunlight to shine through the tent which makes for great photos for formalities if the sun is still out! Bring your guests back to high society colonialism in this beautiful historic brick home nestled in the Rittenhouse neighborhood of Philadelphia. Its quant, yet lush, green garden, designed by one of the first female landscape architects, is a prefect location to say your vows. With it’s smaller size, you’re sure to have the intimate magical ceremony that you’ve always wanted. The reception space, while still harkening back to it’s colonial roots, has a airy and modern fresh feel with it’s powder blue walls that are drenched in light during the day. Add a touch of whimsy to this space by incorporating bright florals and you can’t go wrong! We love gardens of all types, and we think they’re all great for weddings. If you want a garden that’s more formal and whisks you away to a European chateau, Tyler Gardens is your best bet in the Philly Region. It has four tiers of French and Italian inspired gardens adorned with bronze sculptures, stone walls, and fountains and we’re in love! We can’t get over the options of dramatic views for your ceremony and the open tent in the summer. As the sun sets over the tent, the orange light passes though the trees providing a warm and romantic start to your reception. The Fairmount Horticultural Center is THE perfect venue for greenhouse lovers. It’s one giant greenhouse and we’re kind of obsessed. Beautifully curated plants adorn every corner and modern additions like sculptural walls bring this venue to the present day. 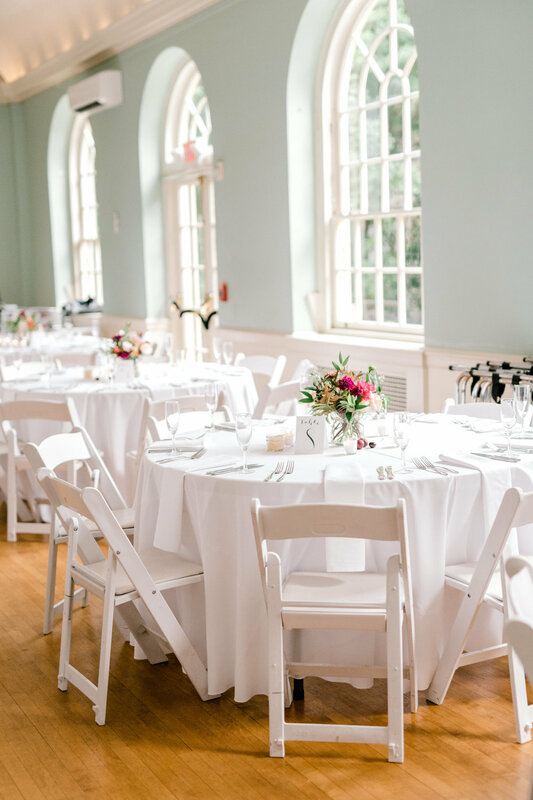 Share your big day with up to 300 guests in the interior space (perfect for all weather conditions) and explore the enormous outside space of Fairmount Park which has cherry blossoms galore in the Spring. Looking for old world pastoral garden vibes with a French chateau feel? Aren’t we all? Well that’s ok, because you can get that right here in Philly at Bartram’s Gardens. Bartram’s is not only the oldest surviving botanical garden in the country, but absolutely stunning and are picturesque at every turn. We simply adore the rustic exterior and interior of the Bartram’s house and all its history as a home for preserving and studying different plant species. The gardens also have a brand new tented pavilion that can hold up to 350 guests and provides them with all the necessary modern facilities. An 18th century fieldstone home in the middle of a 175 acre sprawling green space makes this venue the perfect escape from the city. The Center also provides educational programs regarding the conservation and protection of wildlife habitats and species as well as providing a sanctuary for local bird species. Holding your wedding at the John James Audubon Center supports their mission. Want to be swept away to a beautiful European mansion without the expense of flying overseas? This historic home is one of the most luxurious and romantic venues in the area! It’s Beaux Arts style with French influences gives an old world look that is timeless, classic, and oh so romantic! Located just around the corner is the beautiful Bryn Athyn Cathedral with castle-like enclaves and vine covered archways in a gothic and early Romanesque style for your ceremony and portraits. Looking for something bright and airy that’s also a blank slate and in a perfect neighborhood? Look no further than Power Plant Productions. Nestled in the heart of Old City, Philadelphia in an old chocolate factory building, it’s just steps away from iconic locations like Race Street Pier, Elfreth’s Alley, and other Philly landmarks. With it’s tall ceilings, abundant windows, and whitewashed brick this edgy industrial space is given a softer touch that is both unique and absolutely dreamy. For a special addition to your day, have your ceremony at Race Street Pier overlooking the water with the Benjamin Franklin Bridge in the background! The College of Physicians, more commonly known for the oddities in it’s Mutter Museum, is so much more than the peculiar collection it holds. The building, now over 230 years old, was built as a collegiate society for the public to learn more about medicine as both science and art. The space has an old academic feel with wood and marble finishes and a beautiful garden patio complete with medicine herbs and vine covered bricks. You and your guests can even tour the museum during your cocktail hour. 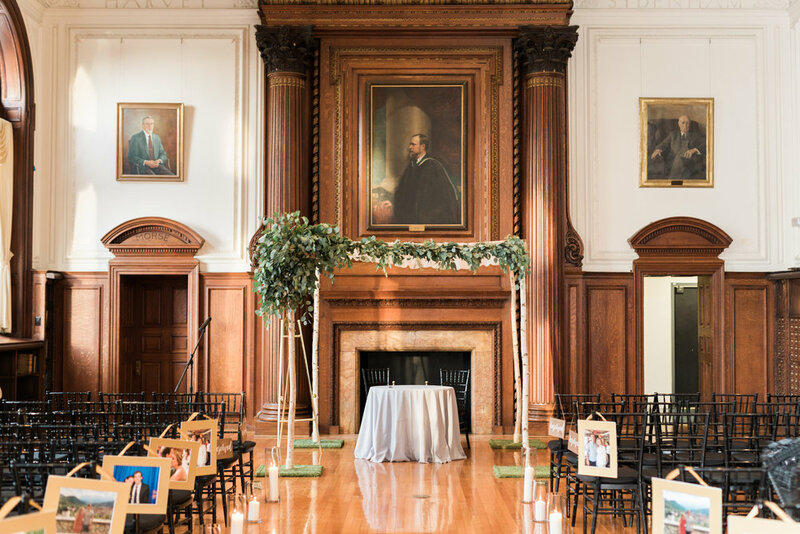 One thing that great venues tend to have is versatility, and with the College of Physicians, you can choose to get married either indoors in the historic library or out in the garden depending on your style (and the weather). While this space could be great for just about any couple looking for a historic venue, we particularly recommend it for those looking with a deep interest in medicine. We love venues with their own unique character, and there are certainly no other venues quite like The Olde Bar. You can see it’s charm before you even enter the building as your greeted with bright red doors and stained glass windows adorning with the Bookbinder’s name. Set in the historic Bookbinder’s building, the Olde Bar is broken down into several spaces including a floor to ceiling wooded bar and a grand dining room that seats up to 200 guests. Garces is the exclusive caterer, so you’re guaranteed good eats for your big day. And the best part is that it’s located in Old City super close to all of the classic Old City landmarks that are perfect for portraits. Nature lovers rejoice, the Awbury Arboretum is the venue of your dreams. Nestled amongst the trees, the Francis Cope House provides the perfect home base for your outdoor soiree, with it’s clean white interior and quaint stone exterior complete with extensive covered patios. 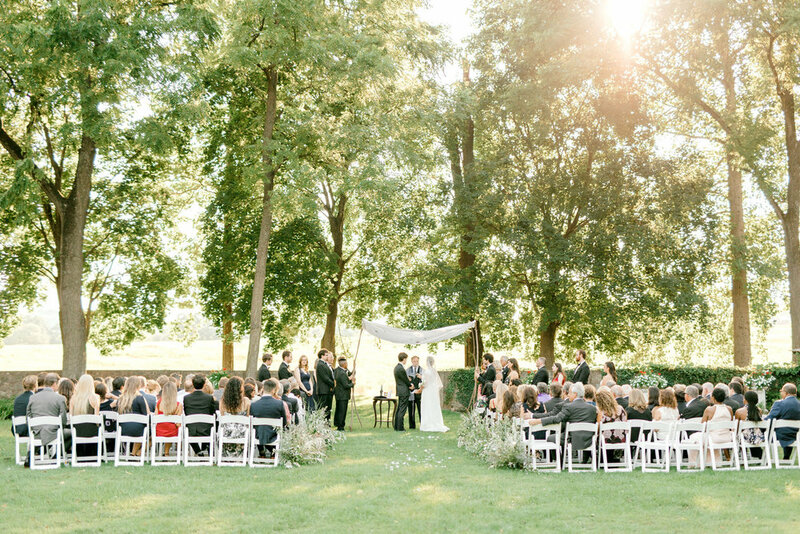 Let mother nature do the work and have your ceremony and reception outside with a lush green backdrop. When sunset comes around, we love escaping to the fields with our couples for a few golden hour portraits that make for the perfect cap to an intimate day. Elegance on a grand scale, the Hotel du Pont gold ballroom is as classy as it gets. Located just 45 minutes outside Philadelphia, getting married in Wilmington is a perfect way to have your sophisticated city wedding without all of the traffic. What makes this place so grand? Imagine huge ornately carved wooden doors and a giant ballroom (with room for up to 500 guests) adorned with a gold ceiling and covered from floor to ceiling in French Neoclassic design. We recommend this place whole heartedly for the slightly more traditional couple wanting a extravagant wedding. Nestled in the picturesque Brandywine Valley, Wintertur sits amidst nearly 1,000 acres of rolling meadows, woodlands and a dazzling 60-acre garden. Imagine the backdrop of your event is the magnificent former mansion of Henry Francis du Pont. Enchanting is the word that best describes the area of the Reflecting Pool. Originally used as Mr. du Pont’s swimming pool and then the site of the first wedding held at Winterthur for Pauline Louise du Pont, the reflecting pool appears to have been designed with weddings in mind. With an event capacity of 350, the area is breathtaking from all views. Brides have dreamt of an entrance as dramatic as walking down the stone staircase and into the lush poolside area. Allow your guests more time enjoying the outdoors and sweeping views by having your cocktail hour poolside. A wedding ceremony at the reflecting pool is a truly a dream come true! Although not technically in Philadelphia, we’ve found that so many Philadelphia natives are head over heels in love with the town of Cape May (including Haley who grew up visiting her grandparents here every summer!) What’s so unique about Cape May to other beach towns is that it’s truly historic and the buildings in the town are required to build in the victorian style when making renovations and upgrades. Congress Hall, one of the oldest and grand buildings in the area is no exception and takes care to every last detail- to the beautiful woodwork and keeping old-school keys for their hotel rooms, to the hand-painted checkerboard ballroom floor. Not to mention it’s right on the beach and smack dab in the heart of town.